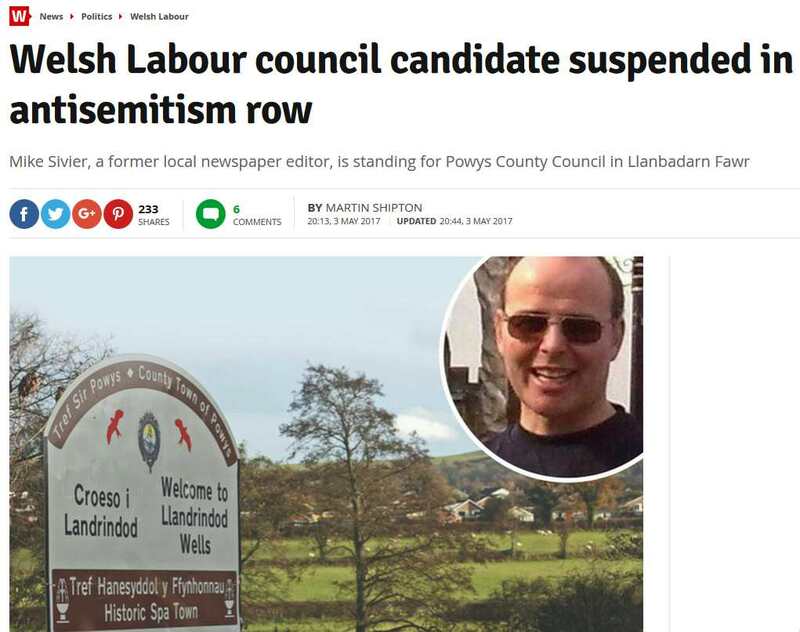 Bogus charity, Campaign Against Anti-Semitism, which campaigns making false and libellous accusations of anti-Semitism, has now stepped up its campaign during the General Election. The latest victims are Dina Mulholland, Labour PPC for Ceredigion and Mike Sivier, who was suspended as Labour candidate in the elections for Powys county council. In addition to the petition calling on the Charity Commission to deregister this Zionist libel machine that masquerades as a charity, [have you signed yet?] I submitted a complaint to the Charity Commission nearly 3 months ago. Despite promises to the contrary the Commission still have not dealt with it. When it comes to complaints from the Right that Student Unions are supporting Israel Apartheid Week the Charity Commission jumped into action under their far-Right Chairman William Shawcross, a former board member of the Henry Jackson Society and a virulent Islamaphobe. But when it's a bogus Zionist 'charity' the Charity Commission does nothing. I have today submitted a further complaint about the CAA’s outrageous and illegal interference in the general election campaign. By defaming Dina Mulholland, the CAA have also committed a criminal offence under s.106 of the Representation of the Peoples Act. I urge you to bombard the Charity Commission with complaints. The CAA is strongly suspected of being funded by a $50m Israeli government slush fund to combat BDS and it is using this to destabilise the Labour Party. What was the basis of CAA's accusation that Dina Mulholland was anti-Semitic? She alleged, in an article, that the Israeli military had sprayed skunk, an evil smelling liquid that is regularly sprayed on peaceful demonstrators, into water tanks making them undrinkable. Apparently this was a resurrection of the ancient libel of Jewish well poisoning! Imagine taking a chunk of rotting corpse from a stagnant sewer, placing it in a blender and spraying the filthy liquid in your face. Your gag reflex goes off the charts and you can't escape, because the nauseating stench persists for days. What the CAA are saying is that allegations against Israeli soldiers or settlers are allegations against all Jews and therefore automatically anti-Semitic. By this absurd logic, any criticism of Israel’s military occupation is automatically anti-Semitic. Of course this is nonsense. People don’t accuse Israel’s army or Israeli settlers of war crimes because they are Jewish but because they are war criminals and racists. Their religion is irrelevant. The original allegation of well poisoning related to the Black Death which peaked in Europe in the 14th century. At that time, not knowing about bacteria, germs etc. people sought an explanation for the death of possibly half of Europe’s population in Jewish poisoning of wells. It has nothing whatever to do with the well documented examples of Israeli military and settler poisoning of the Palestinian wells on the West Bank. No doubt Fred Pearce (see letter to CC below) was also anti-Semitic when he wrote in the Guardian of 1st March 2006, Running on empty that Israeli settlers poisoned Palestinian wells. 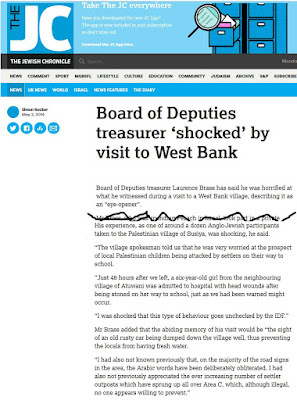 According to the Campaign Against AntiSemitism Laurence Brass's allegations of the poisoning of a Palestinian village well is a medieval blood libel and anti-Semitic - of course it's also true! 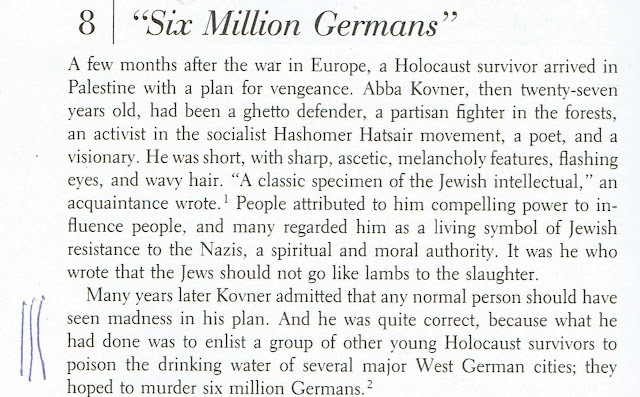 If allegations that Jews may poison water resources is automatically anti-Semitic then what does one make of the documented fact that a group of Holocaust survivors, led by Abba Kovner, plotted to poison the drinking water of German cities as revenge for the Holocaust? It is so well documented that even the malicious liars and perjurers of the Campaign Against Anti-Semitism would be hard put to it to deny it. 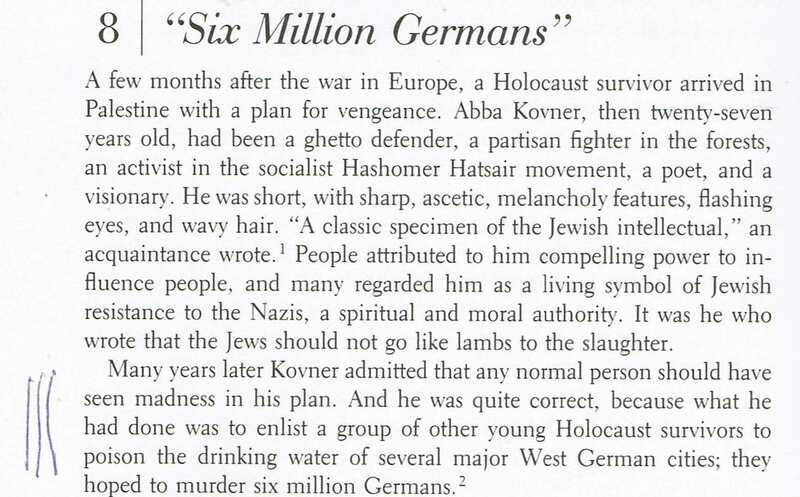 It is documented by, amongst others, Israeli historian and Ha’aretz journalist Tom Segev in his book The Seventh Million, in a Chapter entitled ‘6 Million Germans’ (pp. 140-146). Perhaps Segev is also anti-Semitic? What this shows is that the Campaign Against Anti-Semitism has no hesitation in making the most outrageous accusations of false anti-Semitism against people. 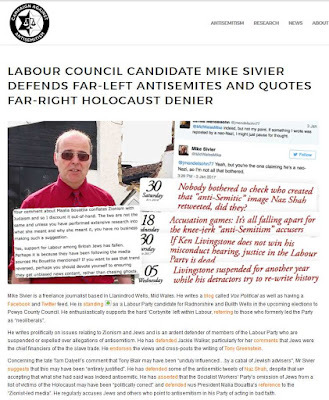 It is a disgrace that the Labour Party Compliance Unit, in its case against the Black-Jewish anti-racist activist Jackie Walker, quotes the racist liar Gideon Falter, Chair of the CAA against Jackie. If Jeremy Corbyn has any integrity he will put a stop to the practice of quoting racists against Black anti-racists and he will fire Iain McNicoll and the head of the Compliance Unit John Stolliday for having used the testimony of racists in their witch-hunt. I have submitted a further complaint to the Charity Commission against the Campaign Against Anti-Semitism. Sign the Petition calling on the Charity Commission to deregister the racist ‘charity’ Camaign Against Anti-Semitism. We now have over 2,800 signatures. Please share widely and let's get at least 10,000 signatures. Also please submit your own complaint to the Charity Commission against this bogus ‘charity’. Thank you for your response to my query as to why the Charity Commission has delayed responding to my complaints of 11th Februar and subsequently against the bogus ‘charity’ Campaign Against Anti-Semitism Registration Number: 1163790. You say that there has been a reorganisation within the Commission. However when Student Unions organised Israel Apartheid Weeks earlier this year, the Charity Commission was able to respond to complaints from the Israeli Embassy and Zionist groups within a very short period of time. When it is convenient, the Charity Commission can move very quickly. The complaints against the Campaign Against Anti-Semitism are even more urgent given that we are now in the middle of a General Election. 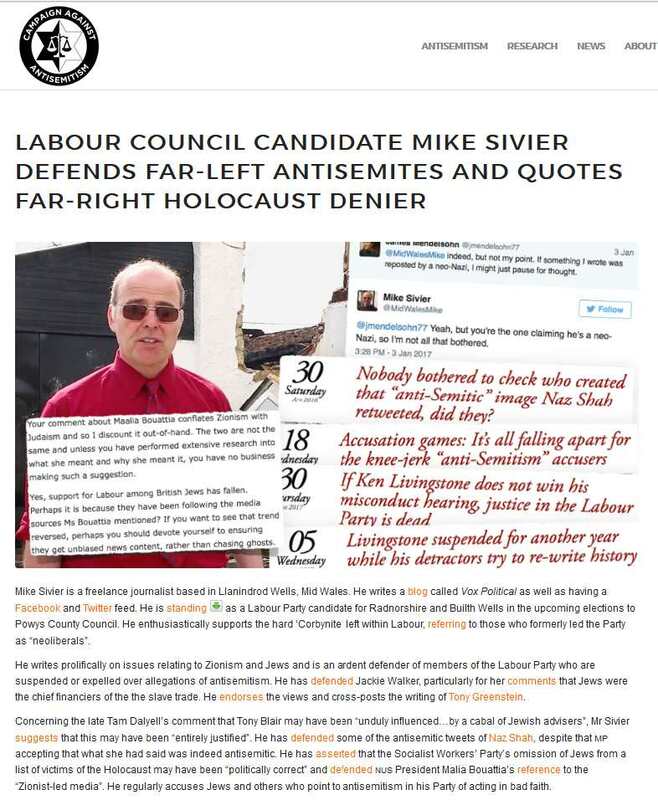 The Campaign Against Anti-Semitism is actively intervening to attack certain, mainly Labour, parliamentary candidates. This must stop immediately and you are under a legal duty to act without delay. The CAA’s actions also breach Section 106 of the Representation of the People Act 1983 which specifies that it is a criminal offence to make or publish a false statement of fact about the personal character or conduct of an election candidate. For further information you might want to consult this briefing on the defamation of candidates standing for election although it would be remiss of you not to be aware of it. I refer in particular to the case of Dinah Mulholland, Labour PPC for Ceredigion. See their Facebook page. 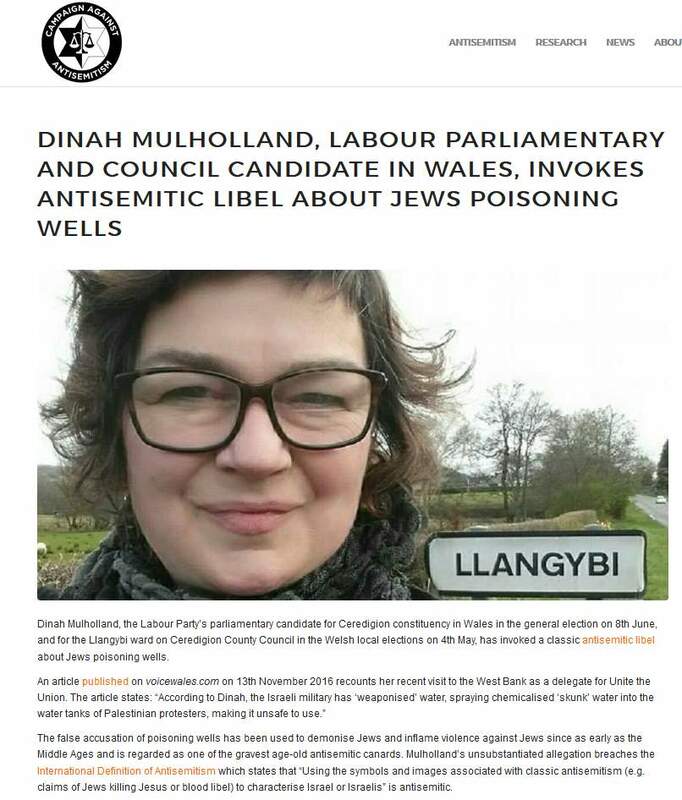 On 3rd May a post appeared on the Campaign Against Anti-Semitism’s website, Dinah Mulholland, Labour parliamentary and council candidate in Wales, invokes antisemitic libel about Jews poisoning wells. The myth that Jews poison wells dates back to the Black Death. If the CAA’s allegations were true this would be a serious offence of incitement to racial hatred and a hate crime. It would also be incumbent on the Welsh Labour Party to replace Ms Mulholland as a Labour candidate. In fact this allegation was a complete and total lie. A wicked fabrication. the Labour Party has now investigated this allegation and has found it to be wanting. A failure to act on your part, given that you are the regulatory body, will be seen as making you complicit in the CAA’s unlawful actions. It will also be an act of gross maladministration and a complaint will be made to the Parliamentary Ombudsman. Ms Mullholland’s accusations did not refer to the Jews, that was the CAA’s interpretation. They related to the Israeli military occupation and Jewish settlers on the West Bank. They do not relate to Jews at all but to Israeli who happen to be Jews. This attempt to equate far-Right settlers with all Jews is itself anti-Semitic according to the very ‘International’ Definition of anti-Semitism that the CAA has recourse to. If the CAA is correct that an allegation of poisoning water against anyone who happens to be Jewish is a resurrection of a medieval anti-Semitic libel, then the Israeli +972 Magazine is also guilty of the same offence. In its edition of November 15 2014 Haggai Matar wrote an article WATCH: Police spray putrid water on Palestinian homes, schools. ‘Oxfam's Geoff Graves took me to Madama, a Palestinian village near Nablus, where neighbouring Israeli settlers poisoned the village's only well and shot at aid workers who came to clean it. Most villagers now buy water from passing tankers, but not all can afford it. Ahmed Qot, a poor farmer, told me he spends three hours every day carrying pots on his donkey to get water from a nearby village for his nine children and five farm animals. It is a fact that the rabidly racist Jewish settlers on the West Bank have poisoned Palestinian wells. There are dozens of such examples. This does NOT mean that this is therefore typical Jewish behaviour. It is the typical behaviour of settler colonists, whatever their religion. 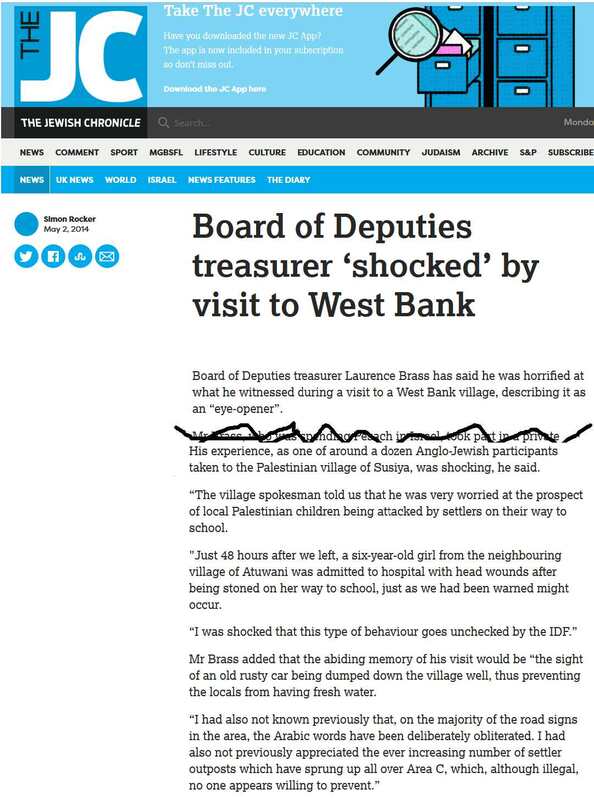 For the Campaign Against Anti-Semitism to suggest that the behaviour of West Bank settlers represents normal Jewish behaviour is itself an anti-Semitic calumny against Jews. The CAA is not only a rabidly Zionist organisation it is clearly anti-Semitic. An allegation against a specific group of Jews that they have tried to or actually poisoned water supplies does not mean that it is necessarily untrue, still less a blood libel. At the end of the second world war, a group of Jewish survivors of the Holocaust, led by Abba Kovner, planned to poison the water supply of German cities by way of revenge for the Holocaust. This is extremely well documented but Kovner was arrested in time. This is covered in the chapter ‘6 Million Germans’ (pp, 140-146) in The Seventh Million (1993) by Israeli historian and Ha’aretz journalist Tom Segev. I don’t believe anyone has accused Tom Segev of anti-Semitism previously but no doubt he will now be subject to the attentions of the CAA. I would therefore appreciate your confirmation that the investigation against the Campaign Against Anti-Semitism will be treated with the utmost seriousness, without any delay and that they will be told to avoid all further comment on General Election candidates. I am sorry that it did not prove possible to respond as Mr Young had indicated. Due to a re-organisation within the Commission I have been asked to carry forward your concerns and will be examining them in detail. It is not possible at this stage to give any timeframe for the conduct of this case. However, once I have completed my analysis I will let you know. I appreciate that this will be frustrating for you, but I can confirm that I am looking in detail at the information you have provided. Senior Technical Case Manager, Regulatory Compliance. You wrote to me on 22nd March stating that you were still evaluating my complaint against the Campaign Against Anti-Semitism and that you were advised it would take a week before a decision was made. It is now over 6 weeks since you wrote to me and I have heard nothing. I suspect that this matter has gone up to your Chairman, the Islamaphobic William Shawcross, who is a hardline Zionist as well as a member of the far-Right Henry Jackson Society and that this is what has delayed your decision. In other words political interference. Please confirm whether my suspicions are correct and if not when we are going to get a substantive response. In the meanwhile this bogus ‘charity’ is continuing to defame anyone who they consider supportive of the Palestinians and opposed to Zionism, especially if they are for example Labour candidates. This alone should have got you doing something quickly and it is a disgrace that you have sat on this for nearly 3 months. I attach to this a petition which at the time this was downloaded had over 2,700 signatures. It is now over 2,800 signatures calling for the CAA to be deregistered as a charity. I also attach the comments from signatories. Thank you for your emails of 12 and 13 February and 3 March, and 22 March. We are still evaluating your complaints against the charity, and particularly your request that its charitable status should be removed. We will examine the further items you supplied on 20 March. I am advised there is the prospect of decisions on these matters within a week from today, after which we will communicate to you our view on the issues you have raised. If we consider that there are issues we must take up with the charity (for clarification or by way of regulatory advice) we will advise you that this is our conclusion. We are considering this information request in parallel to your primary complaint, taking into account the Commission's various legal responsibilities to inform our decision. Again I am advised there is the prospect of a decision on this matter within a week from today, after which we will communicate to you our view. Dinah Mulholland, the Labour Party’s parliamentary candidate for Ceredigion constituency in Wales in the general election on 8th June, and for the Llangybi ward on Ceredigion County Council in the Welsh local elections on 4th May, has invoked a classic antisemitic libel about Jews poisoning wells. The false accusation of poisoning wells has been used to demonise Jews and inflame violence against Jews since as early as the Middle Ages and is regarded as one of the gravest age-old antisemitic canards. Mulholland’s unsubstantiated allegation breaches the International Definition of Antisemitism which states that “Using the symbols and images associated with classic antisemitism (e.g. claims of Jews killing Jesus or blood libel) to characterise Israel or Israelis” is antisemitic. Two new videos catch a police ‘skunk’ truck spraying East Jerusalem neighborhoods with foul-smelling liquid. The smell was so bad that 4,500 students had to stay home from school. The “skunk” trucks drives slowly through the neighborhood. It is evening, and there is no evidence of clashes in the area. The truck proceeds slowly, sprays putrid-smelling water on a nearby building, continues on and shoots once again. When it’s all over, the truck has tainted schools, homes, streets – entire neighborhoods – with its unbearable stink. Just like that. Two videos that were filmed this past week by Palestinian residents of Jerusalem and were given to +972 support claims by residents regarding the inappropriate use of the skunk by the police. In August, the Association for Civil Rights in Israel (ACRI) filed a complaint to the police regarding multiple cases of the arbitrary use of the skunk, especially at times when there are no protests or clashes. It seems that the police has not changed its ways. The common understanding among residents and human rights organizations is that the police are collectively punishing Jerusalem’s Palestinian residents, in light of clashes between youth and police in these neighborhoods. But the punishment neither begins nor ends with skunk water; the police block entrances to these neighborhoods with concrete blocks, detains residents for long hours at checkpoints and hands out petty fines – all at the behest of the Jerusalem municipality. The skunk water targeted the A-Tur elementary school for boys, the elementary and high school for girls, a high school for boys and the “Basma” elementary school for disabled children. All four schools are located on the neighborhood’s main street. For anyone who has not experienced it, words cannot express the smell of the skunk. The Israeli-developed truck is primarily used by the army in the occupied territories over the past several years, although now it is slowly making its way to Jerusalem and Israel. The strong stench smells like a mix of feces and animal carcass – gagging is almost inevitable. The worst part is that there is almost no way to get rid of the smell. Showering doesn’t help, and protesters usually deal with it is by taking a dip in the sea. Objects that have been sprayed with skunk water often smell for much longer periods of time. After being hit with a few drops of skunk water, my camera smelled for nearly half a year. It is difficult to fathom exactly why such large amounts of skunk water must be sprayed at classrooms and homes, as can be seen in the second video that was filmed in the Jabel Mukaber neighborhood of Jerusalem. Like in the video from A-Tur, there are no stone throwers or protesters. The police act casually, there are no rocks being thrown in the air, no sounds of explosions, no screaming or bullets that characterize confrontations in East Jerusalem. Just a skunk truck spraying homes. Over the past several weeks, activists from East Jerusalem have met with members of human rights organizations in order to attempt to formulate a response to the actions of the police and municipality. They, however, found it difficult to arrive at a solution. “Our field coordinators say that people are afraid of the police and do not want to provide testimonies,” says Maimon. “Even people who were shot, such as someone was hit with a sponge-tipped bullet in the head or a woman who was shot and her uterus was torn – when our investigators speak with them, they are afraid that if they speak up the police will find its way to them and find a way to harm them. In response to ACRI’s request, the police responded that the skunk is used according to regulations, but refused to say explain what the regulation says. ACRI has attempted to force the police to publish the regulations vis-a-vis the skunk. Meanwhile in East Jerusalem, the occupation becomes smellier than ever. +972 asked for a response from Jerusalem Police. Their response will be published here. This article was first published on +972′s Hebrew-language sister site, Local Call. Read it in Hebrew here.